The course is being organised by Dr. med. Sigrid Kruse, von Haunersches Kinderspital des Klinikums der Universität München in co-operation with the ‘Landesverband Bayern des Deutschen Zentralvereins homöopathischer Ärzte’. 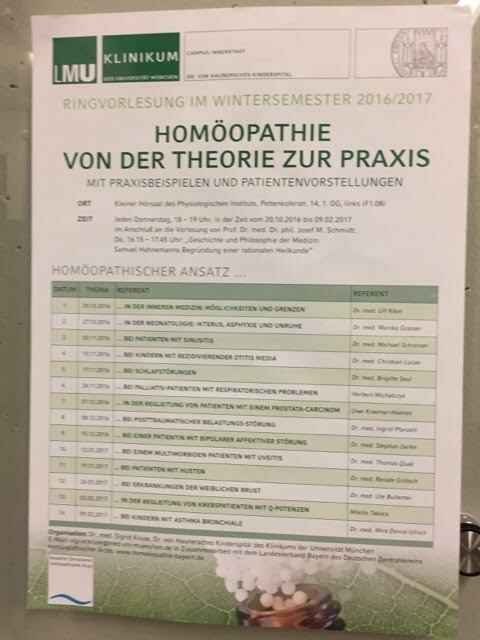 The lecturers of this course seem to be mostly homeopaths from practices in and around Munich. The project „Homeopathy in pediatrics“ was established in the Dr. von Hauner’s Children’s Hospital University of Munich in 1995 to integrate homeopathy into a university hospital. Selected children (outpatients and in the wards) are treated conventionally and homeopathically. The Karl and Veronica Carstens-Foundation initially financed the project over six years. An association of parents, whose children were treated for cancer, funded the project for one year. Since 2002, for the first time in Germany, the National Health Insurance is providing the financial background for two consultants for Homeopathy at this University hospital. Dr. Mira Dorcsi-Ulrich, who initiated the project and carries out the supervision. She is a pediatrician in her own practice with 23 years of experience. Dr. Sigrid Kruse has managed to integrate homeopathy into the clinic, starting at first in 1995 as a resident for pediatrics. Now she fulfills the requests of doctors and parents in the wards demanding concomitant homeopathic treatment. Dr. Christian Lucae mainly treats the outpatients while focussing on his research project with children showing attention-deficit-hyperactivity-syndrome (ADHS). Concomitant homeopathic therapy was successful in the following cases: intracerebral bleeding 3rd degree in premature babies, drug withdrawal in neonates addicted mothers, epilepsy, handicapped children, ADHS, migraine, tic, recurrent infections, asthma and atopic eczema, complications in wound healing and other problems. Homeopathic treatment of children parallel to conventional methods is particularly well accepted in the treatment of cancer. The side effects of oncological treatment like vomiting and stomatitis can be relieved, aggressions and anxiety intercepted and life quality improved. Which journal with a modicum of self-respect or rigor allows a homeopath to publish anything like the last paragraph without providing a jot of evidence? The answer is the ‘ALLGEMEINE HOMOEOPATHISCHE ZEITUNG’ – no further explanation needed, I think. Courses like the one above, run at university level, make me first a little speechless and then more than a little angry. Medical schools should have other roles than teaching impressionable students things that fly in the face of science and evidence. They should guide them to become responsible doctors not misguide them to turn into irresponsible quacks. The fact that this comes from the medical school where I, many years ago, studied, graduated, worked and made both my MD and PhD theses renders the whole thing painfully sad for me personally. But let’s not get depressed… ‘always look on the bright side of life’!!! It looks like the profit driven hospital administrators in Germany are just as unethical as many in the US, who are offering CAM services and “research” departments in some medical schools. It has been estimated that adults in the US spend $34 billion a year on CAM “therapies.” It is the sad cycle where health care profit with or without science or ethics supports “successful” quackery(defined as anything that cons patients to pay for magic). Cons beget profits which begets more cons. This shows the level of disappointment and lack of results that patients are getting from conventional medicine, otherwise why would these patients be looking elsewhere when it costs them much more and not covered by insurance so comes out of their pockets. If conventional medicine was actually achieving good results, noone would bother to go elsewhere for help. this is (mostly) true; medicine is far from perfect and one can understand the disappointment we all feel when it fails. but that does not render homeopathy effective. Hi, I am a Homeopath from Pune, India. Also practiced in U.K.. Recently moved here in Munich. I would like to study/ practice further. Just wanted to know how can I proceed. Step 1: destroy all your books and notes on homeopathy. Step 2: enrol in a course in medicine, if you have the background qualifications, or a course in nursing or physiotherapy if you don’t. “Thank you in advance.” You’re welcome. It is a mistake to ask a question like this on this forum, this is a totally anti-homeopathy site, with very ‘witty’ and clever correspondents who have no experience in homeopathy. They have a lot of very witty and knowledgeable comments to make – at least to themselves, and any one who has had positive experiences with homeopathy is considered to be delusional or enjoying the placebo effect. Strangely, when those very same people used conventional medicine the placebo effect was totally missing from their lives, it only manages to rear its beautiful head when homeopathy is used. Good luck with finding a good school. In 1997, a professional organization especially for professional homeopaths in Germany was founded, the Verband Klassischer Homöopathen Deutschlands (VKHD). One of VKHD’s primary objectives was to establish qualified guidelines for appropriate medical and homeopathic training. These standards are modeled on the ECCH guidelines. Other organizations exist, the largest being Homöopathie-Forum (HF) and Deutsche Gesellschaft für Klassische Homöopathie (DGKH). These non-profit organizations are legally only allowed to work politically for public health (e.g. by promoting homeopathy as a therapy method), and not for the well-being of a group of professionals. The umbrella organization for all other non-profit organizations is the Bund Klassischer Homöopathen Deutschlands (BKHD), with the HF, the DGKH, and Samuel-Hahnemann-Stiftung as its members. Together, the non profit-organizations in BKHD, and the professional organization VKHD are working to establish guidelines for medical and homeopathic training. There are about 2,800 MDs with this qualification, although many others use homeopathy. About 600 practitioners are registered with the ICCH. Polypharmacy is also very prevalent and many heilpraktikers and MDs use polypharmacy preparations with little or no training in classical homeopathic methods. The ICCH lists 31 teaching institutions, five manufacturing pharmacies, seven journals, and three homeopathic hospitals: Robert-Bosch-Krankenhaus, Stuttgart; Waldhausklinik, Augsburg; Harlachinger Krankenhaus, München – most using complexes and low potency organopathic remedies, although the Harlachinger Krankenhaus has some MDs prescribing classical homeopathy with Rajan Sankaran as their supervisor. Germany is represented in the LMHI. is not true and quite funny. the rest of your comment is not much better. Apart from this, experience in homeopathy is about as useful as experience in, for instance, astrology. It provides many insights in the workings of the human mind, in particular with respect to things such as the placebo effect, the fact that the majority of ailments resolve naturally, the importance of giving people personal attention, and of course the less savoury bits such as gullibility and the tendency of people to fool themselves and each other. However, it does NOT provide in-depth knowledge or skills in the field of health, sickness and healing. Homeopathy is not medicine. Homeopathy is merely an entertaining (albeit rather costly) placebo ritual to keep patients’ spirits up while nature takes its course. why can this (https://www.barrietoday.com/local-news/the-story-behind-georgian-colleges-homeopathy-program-and-the-difficult-decision-to-cancel-it-837534) not happen also in Germany? where is the local opposition to quackery? Germany exported such loonies to Georgia and Briton. Pingback: Does the wish of a patient over-rule medical knowledge? I have completed my studied in Homoeopathy from Mumbai. Wanted to do MD from Germany so what’s the procedure? The first thing to do would be to obtain the qualifications necessary to get into a German medical school. 1. Realise that homeopathy is not medicine and does not make you qualified for anything, least of all medical school. I am from the UK so I am not entirely clear whether an MD in Germany is the same as it is here, though I think it is. An MD is a post-graduate research qualification, so it is only open to doctors who are already qualified and have some experience of clinical practice. The majority of practising clinicians in the UK do not have an MD, but it is necessary if you wish to pursue a career in academic medicine, and it helps to give you an edge over the competition when you are applying for a senior position.